Airbus SE and Bombardier Inc., and Investissement Québec, have agreed to close their previously announced C Series transaction ahead of schedule on July 1, 2018. As a result, Airbus will acquire a majority stake in the C Series Aircraft Limited Partnership (CSALP) initially announced in October 2017. The C Series is a family of jet aircraft primarily produced for the 100- to 150-seat airliner market. Airbus, headquartered in Leiden, Netherlands, but with its core production and facilities in France, generated revenues of €59 billion in 2017 with a workforce of around 129,000. Close to 50,000 of those employees are located in France, 63,000 people when Airbus subsidiaries and shareholdings are included. Among a variety of aviation and aerospace activities, Airbus builds a range of passenger airliners from 100 to more than 600 seats. Having delivered 17 C Series aircraft in 2017, CSALP explains it is gearing up to double deliveries in 2018. With the finalization of this partnership, the parties expect increased demand to support a second C Series Final Assembly Line in Mobile, Alabama, dedicated to supplying U.S.-based customers. Airbus explains the C Series is positioned to capture a large percentage of the estimated 6,000 aircraft needed in this market segment over the next 20 years. As previously announced, Bombardier will continue with its current funding plan of CSALP. 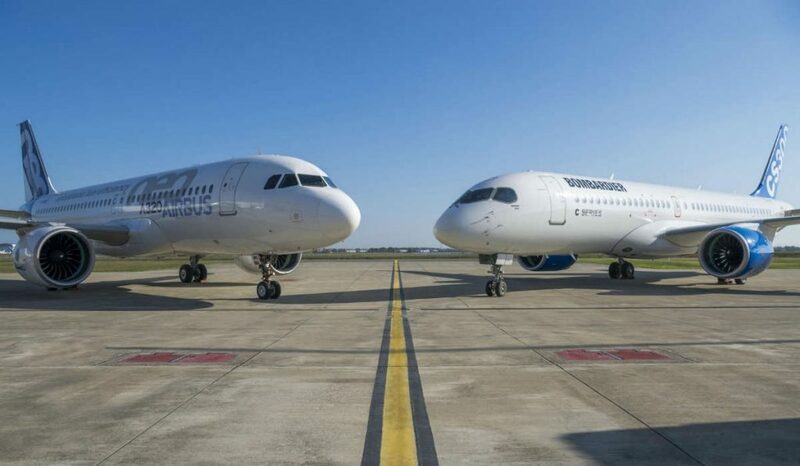 Due to the early closing of the partnership, Airbus noted updated terms of this plan, including: Bombardier will fund the cash shortfalls of CSALP, if required, during the second half of 2018, up to a maximum of US$225 million; during 2019, up to a maximum of US$350 million; and up to a maximum aggregate amount of US$350 million over the following two years, in consideration for non-voting participating shares of CSALP with cumulative annual dividends of two per cent. Any excess shortfall during such periods will be shared proportionately amongst CSALP’s Class A shareholders. Airbus will consolidate CSALP effective from July 1, 2018, onwards.